How do you improve cardio, strength, and insulin sensitivity with no equipment in ten minutes or less? When you’re time constrained or lack equipment, run like a cheetah from a lion to reap major health benefits. Performing the One-Minute Workout below 3 times per week (30 minutes total with warm-up/cool-down) has been shown to produce the same cardio, strength, and insulin sensitivity benefits as 120 minutes of steady state cardio (think treadmill). I love sprinting when I only have a few minutes and need something simple. Sprinting is great for when you’re at the beach, traveling, or need a quick workout at home. The Superman workout below is my favorite exercise routine. It’s good for a shot of dopamine and an ego boost if you’re having a rough day. You’ll feel like the king-of-the-world. Sprints are not the ideal workout for everyone. If you have lower back or leg injuries, skip this routine and focus on rehab and recovery. 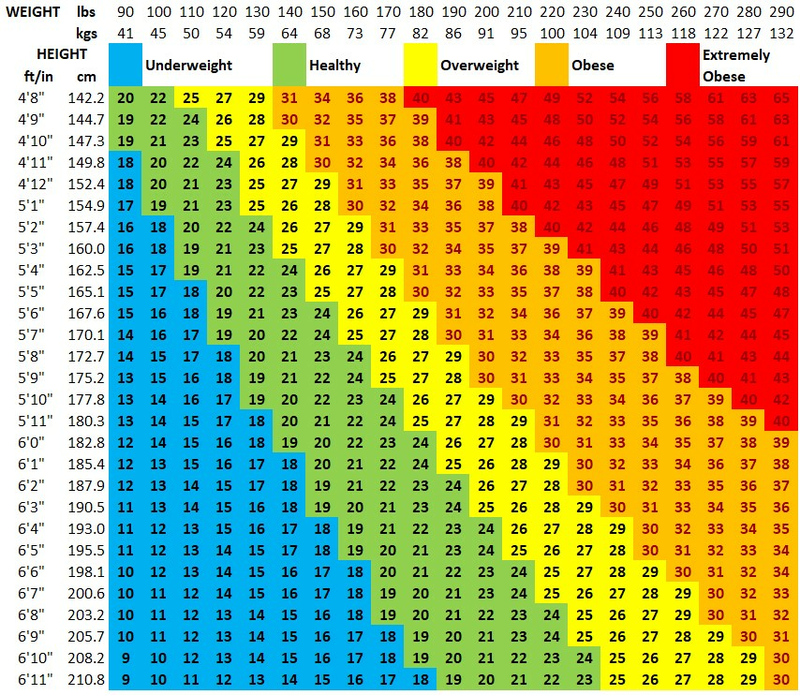 I’m not a big fan of BMI as an absolute indicator of health, but skip sprinting if you’re in the Obese zone. The benefits are not worth the pounding on your joints. Start with lower intensity training like walking or bodyweight exercises. If you’re injury free and at a relatively healthy bodyweight, use the warm-up, sprints, and cool-down below to start your sprint training. Use the variations when you want to change up your routine. Active recovery means you continue performing the same exercise but at a lower intensity. If you ran 100m at a sprinting pace, you would walk or jog back to your starting line at a light pace. If you rowed 150m at a sprinting pace, you would row lightly until your next sprint. If you spent 20 seconds sprinting, take 20-40 seconds to actively recover. You should be able to talk normally without gasping for air. You may not be 100%. Aim for 80-100% recovered. Complete 2-3 minutes of active recovery until your heart rate returns to normal and you can talk normally. If you want to increase your intensity level, complete the sprints routine above running up a hill. You may want to spend extra time stretching your calves and ankles before hill running. Check out this video for a couple options. If you have a yard, a field, or a beach nearby, enjoy running barefoot. The direct contact with the ground has a meditative effect helping you feel more connected when sprinting. If you haven’t sprinted barefoot in a while I’d warm up your calfs and ankles more with stretches like in this video. Lower your intensity level for several sets depending on your fitness level for sprinting. If you’re a regular high intensity runner, use the first few sprint sets to get used to running barefoot by running at 60-80% pace. If you’re new to high intensity running, complete all your sprint sets at 50-80% pace. If you’re in relatively good condition otherwise, you can increase the intensity after a few sprint sessions. This is my favorite workout. You feel like Superman on your last set. Find a 10+ pound weight vest. Wear the weight vest for your first 5-10 sprints completing the main routine above. Before your last set, remove the weight vest. Enjoy running like Superman. If you prefer the Flash, you may want to read this thread to assess whether that’s realistic. If you read it until the end, I owe you a coffee. Seriously, be careful on that last set. Your body is used to the extra weight so you’re generating tremendous force with your running stride compared to normal. You have an increased risk of pulling a muscle. Stay focused, hit your strides, and take it down a half-notch on speed and intensity the first time you do this. After running like “Superman”, you’ll feel like you’re on top of the world. If it’s cold outside, sprint anyway. Remember it’s only 10 minutes. Try it one time to see how you feel. I bet your anticipation will be much worse than actually doing it. Warm up and cool down inside if you have enough space. Bonus – If you run fast in the cold, you’ll be wide awake when you’re done. Take a warm shower afterwards and you’ll be ready to take on the world with a clear mind and strong body. This is actually a 10-minute workout with 1-minute of “work” (i.e. high-intensity sprinting). Performing this workout three times per week (30 minute investment) has been shown to produce the similar results as 120 minutes of steady state cardio in terms of VO2 Max, muscle markers, and insulin sensitivity improvements. The key to maximum effectiveness with this protocol is to perform your working sets at 100% effort. 100% means you’re running for your life like a grizzly bear is chasing you. If you’re a beginner, ease into this protocol. Try speed-walking for one minute followed by light walking for active recovery for one minute for 5 sets (10 minutes total). In subsequent workouts, you can progress to using the protocol below with jogging for your working sets, then running, then sprinting. Increasing intensity from walking to sprints will take weeks to many months depending on your starting fitness level. Read The One-Minute Workout for more details. This protocol can be performed with running, rowing, biking, and other cardio-heavy exercises. * Remember 100% effort means you’re running for your life. Think grizzly bear. Start sprinting today for cardio, strength, and insulin sensitivity benefits. If you’re overweight or injured but mobile, try speed-walking for one minute followed by light walking for active recovery for one minute for ten minutes. If you’re injury free at a healthy bodyweight, use the main warm-up, sprint, and cool-down routine above to get started. Enjoy the Superman variation when you need an ego boost on a rough day. Whatever you do, don’t let time constrain you. 10 minutes or 10 seconds can create a good life.